Each class commences with a visit to a local family. Along the way you will learn about the herbs and vegetables grown at most Khmer households and used in daily cooking. The visit to a familie's home is an opportunity to learn about food preparation in a Khmer home. Who does the shopping and the cooking! Your guide will also let you know about food customs, superstitions and beliefs. A gift of rice is provided to the family as thanks for their participation. Following this visit you return to the pavilion to commence cooking. Together with your chef and guide you will create several dishes which you can then re produce at home. 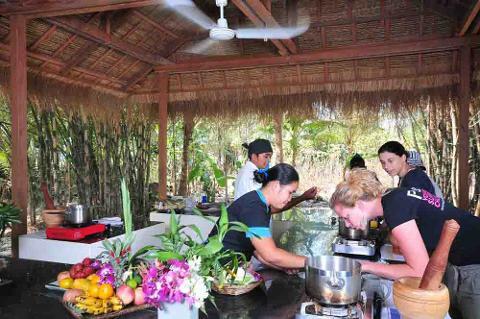 Learn about the typical ingredients in Cambodian cooking and have the opportunity to see Cambodian cooking first hand. Classes are completely hands on. Each participant has their own cooking station and equipment. Classes include a number of Cambodian dishes and a recipe card will be provided.